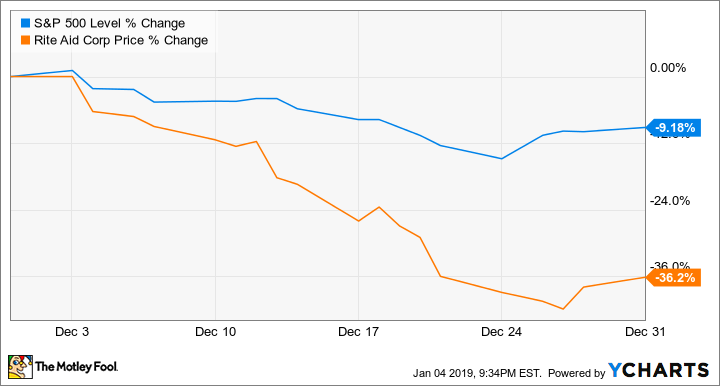 December's big sell-off meant that Rite Aid stock closed out 2018 down 64% on the year. Shares of Rite Aid (NYSE:RAD) sank 36.2% in December, according to data from S&P Global Market Intelligence. The company's stock sold off along with the broader market's slide and also declined following the publication of mixed earnings results, narrowed full-year guidance, and a pharmaceutical supplier deal that was met with conflicting reviews from shareholders. Rite Aid reported third-quarter results after the market closed on Dec. 19. Earnings for the December quarter came in ahead of expectations, but the market's trek into bearish territory and shareholder dissatisfaction with the drugstore chain's management and direction pushed the stock lower despite initial post-earnings gains. Rite Aid's third-quarter revenue rose 1.8% year over year to reach roughly $5.4 billion, and same-store sales climbed 1.6% thanks to a 3.1% increase in prescription growth offsetting a 1.5% decrease in front-end sales. The company's adjusted earnings per share came in at $0.01, flat year over year but ahead of the average analyst target for a per-share loss of $0.02. Rite Aid also published a press release on Dec. 19 revealing that it had agreed to extend its partnership with McKesson (NYSE:MCK) to have the pharmaceutical supplier source generic and brand-name drugs for its stores through 2029. However, shareholders may have wanted more visibility into the terms of the McKesson deal, and analyst questions during Rite Aid's earnings call reflected concerns that the company had not chosen to exercise its option with Walgreens Boots Alliance (NASDAQ:WBA) for pharmaceutical sourcing. Walgreens purchased nearly 2,200 Rite Aid stores and three distribution centers in 2017, and as part of the deal, Rite Aid had an option to source drugs through Walgreens Boots Alliance Development. Rite Aid shares rose briefly following the earnings release and McKesson news, but negative sentiment surrounding the company's relatively minor guidance revision and new supplier deal helped pull the stock to a five-year low. Walgreens ended December down 19.3%, and McKesson closed the month down 11.3%. 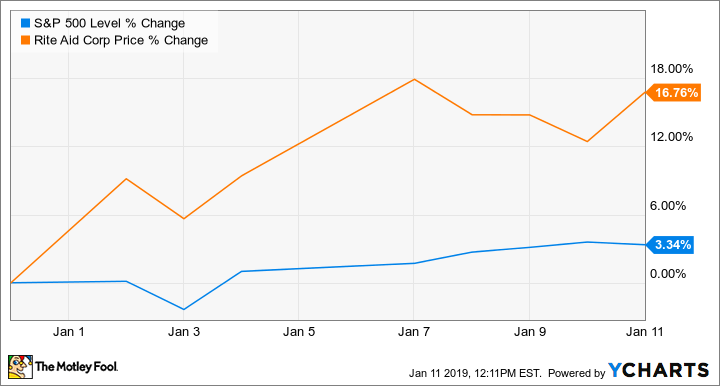 Rite Aid stock has regained some ground in January, with momentum for the broader market helping to push shares up roughly 16.8% in the month so far. However, the stock is still in dangerous territory. Rite Aid CEO John Standley has lost favor with some shareholders following a failed merger with Albertsons. The precipitous declines have put shares below the $1 mark, which means the stock is no longer in compliance with New York Stock Exchange rules. Because a stock is subject to delisting if it trades below $1 for 30 days, Rite Aid may need to implement a reverse stock split in order to stay on the NYSE. The company appears to be flying solo for the time as it aims to fortify its business and stave off threats from other brick-and-mortar chains and online pharmacies by bringing a wellness-services focus to many of its stores. Rite Aid has a big sales base, recording roughly $21.7 billion in revenue over the trailing-12-month period. The company's EnvisionRx pharmacy benefits subsidiary appears to be healthy, too, and has attracted potential buyers. However, investor exodus from the stock suggests that the business's execution has left a lot to be desired, and the market remains dour on the company's prospects. Check out the latest Rite Aid earnings call transcript.